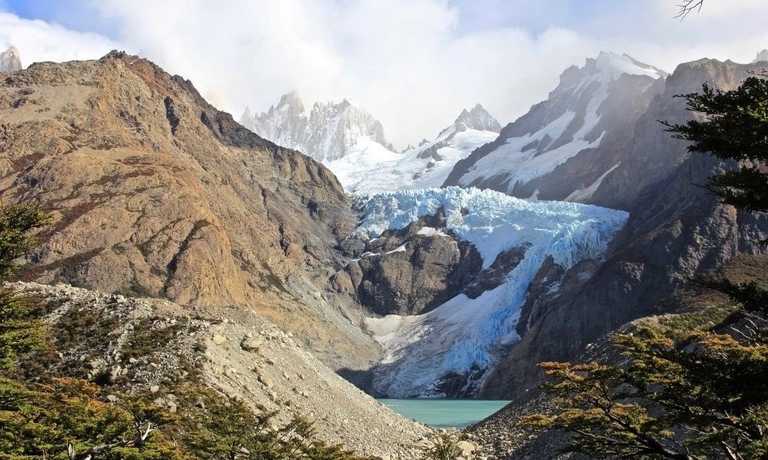 A challenging trek, camping in the mountains for 5 nights as you head towards the climbers' base camp, crossing some high passes and allowing you stunning views of the ice field, endless mountains and Fitz Roy at sunrise. Hike solo or with a guide depending on your preference and group size. Transportation from El Chalten to the bridge over Rio (river) Electrico. Hike until we reach Piedra del Fraile Campsite (530m), heading along the Rio Electrico valley (2 hours). The campsite has a food and beverage service plus a refugio. Once here we can hike to Laguna (lagoon) Pollone (900m) in the afternoon from where we can appreciate the Fitz Roy inferior glacier and the North face of Fitz Roy plus the Pollone needle. This hike is along rocky terrain and takes about 3 hours. We start hiking towards the base camp of Fitz Roy, along the valley of Rio Blanco. We pass by the front of Glaciar Piedras Blancas and then we pass by the Rio Blanco campsite. We will hike up from here to Laguna de los Tres (1200m). This viewpoint has the closest and best panoramic view of Fitz Roy. From here, we descend until reaching the Poincenot campsite (750m), where we will spend the night. This hike has an elevation gain of 700 meters and will take approx. 7-8 hours. Poincenot campsite is a good spot to take pictures of Fitz Roy during sunrise. After breakfast, we will leave for our hike to Laguna Torre, passing by Lagunas Madre and Hija. The hike to Laguna Torre is about 3 hours and the idea is to have lunch there. 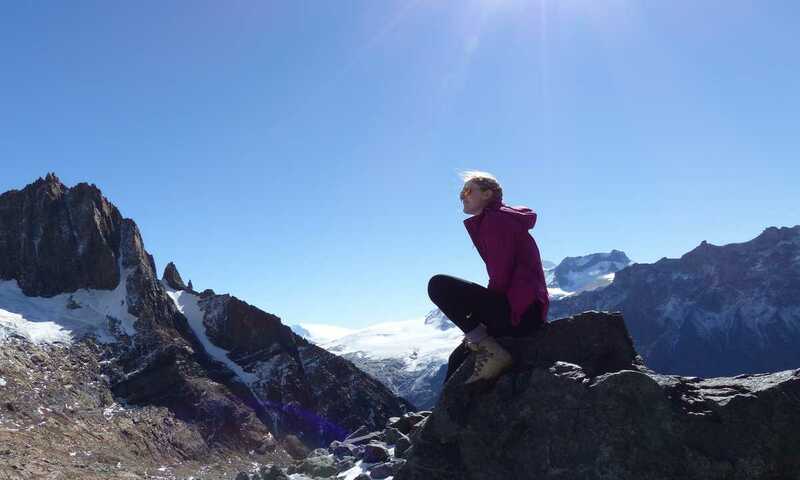 If the weather allows, we will continue until we reach the Mirador Maestri (the principal viewpoint of the mythical Cerro Torre). Then we will return to our camp at Thorwood to spend the night. This hike takes 5-6 hours and has an elevation gain of 300-400m. From Thorwood campsite we walk about 30 minutes until we arrive at the source of the Rio Fitz Roy. We will use a fixed cable line and harnesses to cross the river. Then we climb through a steep forest towards Paso de Las Agachonas (1400m), a pass at Pliegue Tumbado. 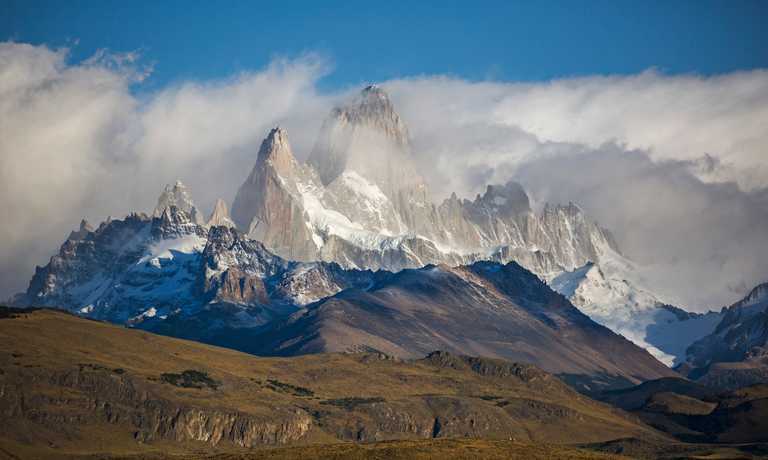 The panoramic views of Cerro Fitz Roy and Cerro Torre from this point are unimaginable. From here we descend the valley of Rio Tunel and we camp at Laguna Toro (600m). This hike has an elevation gain of 800m and takes approx. 6-7 hours. After 30-40 minutes of walking around Laguna Toro, we cross Rio Tunel: wading through the river or using a fixed cable line, depending on the conditions. The ascent to Paso del Viento passes through trails, moraines and a brief section of glacier trekking on the Glaciar Tunel Inferior. From the Pass (1550m), we can appreciate part of the Patagonian Ice Field; the source of Viedma Glacier and Mariano Moreno Range, among others. We return by taking the same trail to Laguna Toro campsite. The hike has an elevation gain of 900m and takes about 7-8 hours. We return to El Chalten by taking a trail that goes through an open valley and lenga forests, traversing the lowest part of Pliegue Tumbado. This hike has an elevation gain of 300-400m and takes 5-6 hours.